One of our great youth leaders at Morningside, Sherry Thornton, emailed me a bunch of great Christian comic strip images the other day. Here’s my favorite. I can imagine Anderson and Ellis asking me this question in a few years. I pay tips all the time…tips to waiters, waitresses, and even to the ladies who cut my hair at Great Clips. 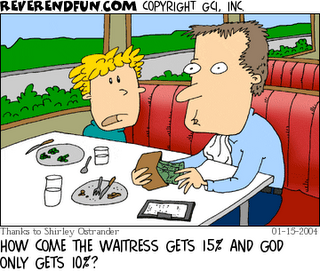 However, why is it that we as Christians often ask questions like, “should I pay 10% of my gross income or my net?” to the Lord (the maker of heaven and earth) and then not blink an eye paying a 15% or more tip to a service provider? This child in the cartoon poses the question – as only a child could.